Veterans Day underscores military service and contributions to clean drinking water systems and water resilience. What we think about veterans is likely wrong. "Research suggests that vet stereotypes are common — and harmful... the average American likely possesses an inaccurate understanding of the veteran experience," wrote Meaghan Mobbs, a military transition researcher for Psychology Today. "Real psychological distress can arise from (negative) stereotypes, their perpetuation, and unintentionally confirming them... This anxiety can impact a person’s ability to perform, preventing them from doing their best," Mobb went on to elaborate. A growing number of military veterans who now work in the water sector are speaking up about the combination of character and professional development they received from their service. The positive impacts of engaging and recruiting both active-duty personnel and veterans to support challenging efforts are exactly what's needed to sustain clean, safe water supplies -- especially as large numbers of Baby Boomers retire, leaving critical job vacancies. "Vets have an ingrained work ethic that matches that of an effective utility. They are highly trained and have necessary skills. Most importantly, they are looking for positions where they can make a difference and have a positive impact on communities," notes Dr. Stuart Karaksik, Ph.D., a proponent of the American Water Works Association's Veterans Workforce Initiative. Understanding technical operations, committing to teamwork, and accepting high demands of leadership roles are trademarks of veterans like Eric Garcia, Operations Manager of Camrosa Water District. He credits the nine years in the U.S. Air Force (USAF) for teaching him to "develop organizational processes needed to get effective results (and persevering) through complex problems with a lot of uncertainty, no obvious solutions, and very high stakes." James McCarty, Manager of Environmental Quality, at Arkansas-based Beaver Water District also served in the Air Force. His current role leverages a strong background in scientific research, project management, and public engagement to direct the source water protection program and work with watershed partners. KISTERS North America's own Water Quality expert, Matthew Zane, also served in the Air Force before completing his undergraduate studies in Geological Science. His dedication, focus and collaboration with clients are key to meeting regulatory compliance requirements in urban and ag sectors. 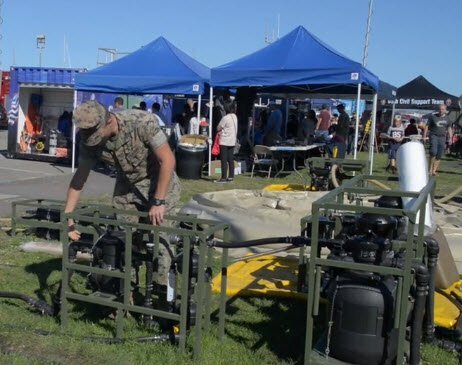 It's not uncommon for Marines to set up and oversee tactical water purification systems that immediately desalinate seawater into potable water for U.S. and ally forces, crisis response and humanitarian assistance. A series of multiple water filtration systems performs reverse osmosis and stores thousands of gallons -- which can be used for drinking, sanitation and hygiene. Lance Cpl. Issac Velasquez said Water Dogs, another name for the Marines, must address issues according to sea levels, water pH levels, and even pressure levels in order to "consistently provide fresh water to troops." Given opportunities to thrive as water industry professionals, veterans are expected to continue to serve a significant asset to water utilities and their communities.